The Phone goes by the name BitVault touted as the world’s fist crypto-communicator. BitVault will be entirely produced in India without a single Chinese component. The best thing about BitVault is it will boast some security feature that will make the entire device encrypted. India is about to develop a phone which will bring some advanced security features. 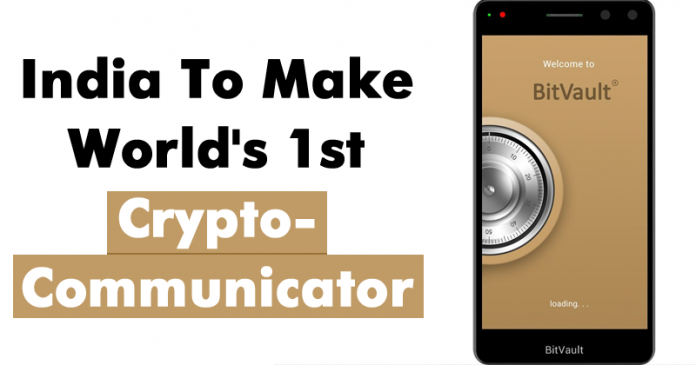 The Phone goes by the name BitVault touted as the world’s fist crypto-communicator. The best thing about BitVault is it will boast some security feature that will make the entire device encrypted. BitVault will be entirely produced in India without a single Chinese component. The smartphone will be launched globally and will go on sale from November 2017. The phone was made jointly by Embedded Downloads, Ireland and VVDN Technologies, India. BitVault will utilize the biometric identification combined with near-field communication tech. Users can create private and public keys each time the device is used by operating the iris and fingerprint scanner. The best thing is, these private and public keys are not stored anywhere. These private and public keys will be used for encryption process of the transaction, application, and communication. Apart from all of these, users can also enable the Bitcoin transaction to create multi-layer encryption.